Just so nobody accuses me of bias I’m going to begin with an example of anthropomorphism that is pretty benign, and could help people identify sympathetically with insects. It is often too tempting and too easy to ascribe human behaviors to nonhuman animals. At times, it can also be inappropriate, as with this case of a beetle presumed to be playing with sprinkles. Although many nonhuman animals exhibit play behavior and this behavior can serve as an invaluable means of preparing for future challenges, this beetle is most likely on the search for viable edibles. Ladybird beetles are voracious aphid predators and the sprinkles may fall within the aphid size range to warrant the beetle’s inspection. I suspect we are witnessing a motivated (ie, hungry) predator responding to reasonably comparable stimuli by handling sprinkles as potential prey items. Watching the video myself I thought that rather than having a joyful experience this beetle might be profoundly frustrated. 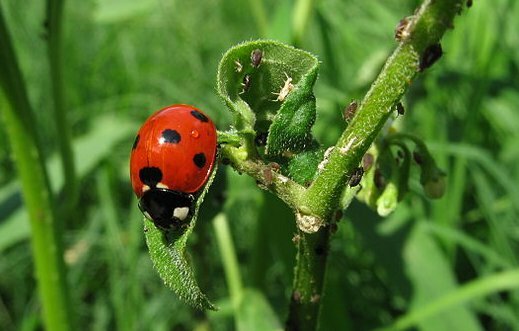 Ladybugs can eat thousands of aphids in their 3-6 week life. Ever seen the dessert tray of a restaurant with surprisingly realistic looking plastic cakes and pies? Imagine pies were all you ate and you were hungry in a room full of plastic pies, or -as Ian offers – that you are on a street full of Asian restaurants but they all put honey in their stir fry. Play behaviour is difficult to define but also pretty rare and, as far as I have seen, undiscovered in insect species. But ladybugs have been found to have an incredible ability that aids in their hunt for food. Ladybugs’ cute colourful round appearance and the fact that you can’t see fangs or any other clues to their predatory nature cues our anthropomorphic tendencies to infer that their motivations are cute and cuddly as well. To an aphid a ladybug is just as threatening as any lion and science has shown they can do something a lot more complicated than waiting by the watering hole for a wildebeest.